I have recently transitioned my projects over to Rapid Board with the latest GreenHopper updates. I use time for estimates so when I am building a sprint, I can see how long the estimated issues are going to take, and keep it under 2 weeks per dev. Some of the issues already have sub tasks with estimates for various reasons. We have been allowing Jira to calculate the estimate and remaining on the parent taks and it has worked fine before Rapid Board. Now, when I am trying to set up a sprint, any issue with sub tasks does not show the calculated value and I can't actually see what amount of work the parent issue represents. If I change the parent task estimate manually, when I add other sub tasks, they get added to the values, and the math is all wrong. It seems that the new Rapid Board doesnt want me using Jira issues the way I have been, yet using auto calculated sub tasks seems to make so much more sense if I dont use a Rapid Board. I have read that Atlassian thinks its working fine, so it must be something I am misunderstanding about how to use the Rapid Board. Any suggestions on what I should be doing different? Let me start by saying that in GreenHopper 6.0.3 (which is due out in a week or so) on boards that are configured for 'Time Tracking' the sum of the remaining estimate for the stories and sub-tasks will be shown in the sprint footer next to the sum of the 'estimate' value for the stories. So this will help achieve what you're looking for here. But if you'll indulge me I'd like to provide a full explanation of why we we've offered 'Original Time Estimate' as an 'Estimate' value and not 'Remaining Estimate'. Some of my discussion refers to agile concepts that anyone reading probably knows well but I've included it because the context is important. Note that the discussion refers to the best practices we've implemented as the main path in GreenHopper, you can choose not to use this approach if you feel it's really not suitable. In Scrum there is a distinction between estimation and tracking. Estimation is typically performed against Primary Backlog Items (PBIs, usually stories) and is used to work out how long portions of the backlog might take to be delivered. Tracking refers to monitoring the progress of the sprint to be sure it will deliver all of the stories that were included. Tracking is often performed by breaking down stories in to tasks and applying hour estimates to them during the planning meeting then monitoring the remaining time in a burndown during the sprint. The primary purpose of applying estimates to the PBIs is to use that information to work out how long it will take to deliver portions of the backlog. In traditional development environments teams would estimate items in 'man hours' and these would be assumed to be accurate. They could then count up the hours in the backlog for a project, divide by the number of people on the team and hours in the week to reach a forecast date. Of course, these estimates often proved to be wildly inaccurate because they did not take in to account the natural estimation characteristics of the team (for over/under estimation), unexpected interruptions or the development of team performance over time. The inaccuracy of the estimates combined with the significant cost of the time spent trying to 'force' them to be accurate makes the 'man hours' approach difficult if not impossible to make work. So in the Scrum world most teams do not try to achieve estimation accuracy, instead they aim to achieve a reliable velocity. The velocity is a measure of the number of estimation units that a team tends to complete from sprint to sprint. After their first few sprints most teams will achieve a reasonably consistent velocity. Armed with velocity and estimates on the PBIs in the backlog teams can look forward to predict how long portions of the backlog will take to complete. The key is that it does not matter what the estimation unit is, just that from sprint to sprint it becomes reasonably predictable. For example, teams can choose to use 'ideal hour' estimates but it's neither necessary or expected that those hours will have any close relationship to elapsed time. If a team has 'man hour' capacity of 120h in each sprint but a velocity of 60h that makes no difference because the 60h velocity can still be used to estimate the number of sprints that portions of the backlog will take to complete and therefore the elapsed time. Many people then start wondering where 'the other 60 hours' went and implying that there is something wrong with team productivity. But that's usually got nothing to do with it, a team's estimates merely represent their view of how hard items will be and they're always polluted by the team's natural behaviour (for example over/under estimation) as well as organisational overhead etc. The velocity is all that matters from a planning perspective. Since the units are not related to time, most teams now choose to use story points (an arbitrary number that measures the complexity of one story relative to others) as their estimation unit. Story points clearly break the mental link with time. Velocity will only reach a stable state as long as the team estimates each backlog item with the same level of accuracy. In fact, it's probably better to say that each item should be estimated to exactly the same level of inaccuracy. At the risk of repeating the obvious, the goal of velocity is to be able to look at a backlog of not particularly well understood stories and understand how many sprints it will take to complete. This requires a similar level of uncertainty for all of the estimates that are in the backlog. One of the counter intuitive implications is that teams should estimate each item once and not change that estimate even if they discover new information about the item that makes them feel their original estimate was wrong. If the team were to go ahead and update estimates this 'discovery of new information' will happen regularly and result in a backlog that has some items that have higher accuracy but most that don't. This would pollute velocity because sprints with a larger percentage of high accuracy estimates will complete a different number of units compared to those with a lower percentage of high accuracy estimates. As a result the velocity could not be used for its primary purpose, estimating the number of sprints it will take for a set of not well understood stories in the backlog to be completed. Therefore it's critical to use the first estimates so that the team's velocity realistically represents their ability to complete a certain number of units of not well understood work far ahead in to the future. But what about when teams realise they've gotten it wrong? Issue X has an original estimate of 5 days. The issue's estimation was too optimistic and they realise it's actually 15 days before the next sprint is planned. However, the inaccurate estimate of 5 days is unlikely to be an isolated occurrence, in fact the estimates are always going to be wrong (some very little, some wildly so). Often this will be discovered after the sprint has started rather than before. As long as the team estimates the same way across the whole backlog this will work it self out over time. For example if they always underestimate they may find that for a 10 day sprint with 4 team members they can only really commit to 20 days of their estimation unit. If they have established a stable velocity this has no effect because from a planning perspective we can still estimate how much work we'll get done in upcoming Sprints with good certainty. But doesn't that break the Sprint Commitment? When it comes time to start a sprint, the team can use the velocity as an indication of items from the backlog they can realistically commit to completing based on the amount they have successfully completed in the past. However, many people immediately question how that can be right when the original estimates will not include information about work that might have already been done or discovered information about how hard the work is. An issue has an original estimate of 10 days. The team works 5 days on the issue in the current sprint. The team discovers a bad bug somewhere else in the project and decide that fixing that bug in the current sprint is far more important than completing issue X as planned. The sprint gets finished and the issue returns to the backlog. In the next sprint the team would be tempted to update the estimate for the issue to 5 days and use that to make their decision about whether to include it in the sprint. The implication is that they might not include enough work in the next sprint if they used its original estimate of 10d. However, the reason that the task was not completed previously is because of unplanned work, it's unrealistic to assume that won't happen again in the future, perhaps even in the next sprint, thus the 10d is a realistic number to use in absence of certainty. As a result the cost of the unplanned work that may happen is eventually accounted for in the original estimate. Even if the work does turn out to be insufficient for the next sprint the team will correct that by dragging more work in to the sprint. In the same example, consider if this were the only issue in that sprint and will be the only issue in the next. If the issue is completed in the second sprint and we use the remaining estimate the velocity will be (0d + 5d) / 2 = 2.5d, but the team can clearly complete more work than that in future sprints. If we use the original estimates the velocity will be (0d + 10d) / 2 = 5d. The use of the original estimate accounts for the fact that the team cannot commit to 10d in every sprint because unplanned work will likely make that impossible, it also realistically accounts for the fact that unplanned work will not happen in every sprint. Why not estimate on sub-tasks and roll that up for Velocity and Commitment? Many teams break down stories in to sub tasks shortly before the sprint begins so they can use the stories for tracking. This raises the possibility of using the sum of the estimates on the sub-tasks as a way to decide which issues to commit to in the sprint (and potentially for velocity). As described above, tracking is really a separate process from estimation and velocity. The estimates that are applied to the sub tasks are clearly higher accuracy than those that were originally applied to the story. Using them for velocity would cause the velocity to have both high and low accuracy estimates, making it unusable for looking looking further out in the backlog where stories have only low accuracy estimates. In addition, only items near the top of the top of the backlog are likely to have been broken to tasks, so using task estimates for velocity means that the velocity value could only ever predict the time to complete the backlog up to the last story that has been broken in to tasks. Using the sub task rollup to decide the sprint commitment would also be dangerous because unlike the velocity value it does not take in to account the overhead of unplanned work or interruptions. Many industry leaders are moving away from hour estimates of any sort. This makes sense because the main questions to be answered are 'How much work can we realistically commit to completing this sprint?' and 'How long will this part of the backlog take to deliver?'. A story point approach based on original estimates can deliver the answers to these questions without the anxiety around 'accuracy' that teams feel when asked to estimate in hours. The GreenHopper team itself uses the approach described in this article and has established a reliable velocity that we have used to plan months in advance, even when new work has been encountered during those months. We recommend this approach because while it is sometimes counter-intuitive it is also powerful, fast and simple. All of that said one of the key precepts of Agile is finding the way that works for you. So GreenHopper does support the alternatives described above including the use of remaining estimates for sprint commitment, hours for estimation and hour estimates on sub-tasks. Thanks for the very detailed explanation. This is what I was looking for. As a suggestion, having this available for new customers would be very helpful. My team has a heavy waterfall background and we do not necessarily follow (or know) all the "rules" of scrum. Having a clear indicator of how the features are intended to be used in cases like this were lots of people have questions is very helpful. This is great. Shaun, thanks for this well-written answer and for sharing the GreenHopper team's practice! Great writeup and should definitely get a more visible place than as an answer here. Perhaps a blog? "So GreenHopper does support the alternatives described above including the use of remaining estimates for sprint commitment, hours for estimation and hour estimates on sub-tasks." Sure, in the configuration for the board on the Estimation tab choose "Original Time Estimate" as the Estimation statistic then enable time tracking. It's a bit surprising to hear that most people you know use time for PBIs, for what it's worth in the last GreenHopper user survey 44% of respondents reported using Story Points vs 28% who reported using Man Days. Overall the very significant majority of users reported estimating in units that do not relate directly to time. Note that the discussion refers to the best practices we've implemented as the main path in GreenHopper, you can choose not to use this approach if you feel it's really not suitable. As GreenHopper currently doesn't provide the option(!) to add up task and sub-task estimates, it is hardly possible to switch to the approach several people would like to use. The tool forces the user to take just that "main path" - or face uncomfortable consequences. As there are several people in this thread who are so frustrated about the lack of this little, optional feature, and you already stated that 28% of the GreenHopper users report using Man Days, I'd propose to just add this feature. It does not disturb anybody using the standard approach, as it should be switched off by default. But a lot of people would really love to have it, as it makes their lives a lot easier. I do get why you guys think it is not good to estimate sub-tasks or use time as estimation unit. Thats fine and I tend to agree. What I really do not get is why you just dont give the option for those that want it. Looks really easy to do, Jira itself already does it on the main issue view. Is just a simple option. Those that do not want to estimate sub-tasks as proposed here dont do it. Whee, congratz for using Scrum as it is intended to be used! But those that do need for many practical reasons to be not so scrum purists while would love to use the amazing tool, why not just give them the option? If atlassian want to use this article as excuse, well, mabye should fully remove the option to use original time as estimation unit instead of just not giving us the sum of sub-tasks? +1 for Cristian Thiago Moecke I'm sorry but even I would, I couldn't change suddenly the way my company is working, just because Atlassian tell me so. I would like Atlassian to remember that the great power of JIRA is his huge flexibility. Another +1 for Cristian. I'm glad I came here and read Shaun's answer, but it still would be nice to be able to use subtasks and hour tracking for a non-development team. Come on! People use JIRA for things other than software development. Or at least we do for now. This is a great answer! But I'm struggling to understand how to use Jira in the manner that is described. I agree that estimates at the story level are a different accuracy to those at the sub-task level, and ultimately you can only measure velocity with the former. So, if they're two different things (one a 'low fidelity' estimate, useful for measuring velocity, and the other a more accurate estimate, useful for measuring remaining time once work has begun), how can we get them to sensibly co-exist in Jira? Here I have added a bunch of sub-tasks to a story with no original estimate. You can see that in the Estamation Statistic bubble is empty, yet the remaining time for the story is 4 hours. At this point, I would really like an option for the Estimate to not be "unestimated". I see this as being a relatively simple thing - If only I could select "Σ Original Time Estimate" as the "Estimation Statistic" instead of the current "Original Time Estimate". This is how things can be done in JIRA - why not greenhopper? So, now I have the correct Estimate and the sub-tasks are all estimated as well, but this just feels wrong. I have an "Unestimated" Parent in my remaining calculation yet _clearly_ my parent has an estimate. How is this state even possible, and why should I have to do this? Again, this just feels like a bug. I'd really appretiate a response to this matter. If preferred, I can be reached offline. I agree with this post. This is a very frustrating and confusing behaviour. Hi, I am facing the same issue. Is there any resolution to this problem? Oh God yes! Just spent the entire day figuring this out to make it work! Can we please get this! we have the same problem here as the actual behavior is just confusing! After reading the complete explanations i also agree with you that estimate and tracking are to be separated, but the problem is the different meaning of the original estimate between JIRA and GreenHopper! As most of the others we do backlog estimation on story points or hours (depending on how agile our teams are) and we do also freeze the original estimate while starting work to have a baseline. In both cases shortly before the sprint will start we create the according subtasks and estimate them in hours. For "Storypoint-Teams" it seems to work but team using hours getting in troubles. The original estimates from the subtasks (tracking effort) are added to the remaining estimate from the parent (estimate effort) until i went through each task to eleminate the parent s estimate. But, going to approx. 20 parents for each sprint is far away from being smart, it s more like a workaround. In my opinion this is a design bug as the same field is interpreted in a different way! I would suggest to change JIRA s behavior to reflect GH idea of estimates, as example in case of having subtasks and checkmark the "summarize from subtasks" ignore the remaining estimates (which are filled from the original estimates automatically) Another option would be to add another field for GH estimation which reflects the expected behavior. 1. The sub-tasks estimates should roll up to the parent, avoiding the double-counting problem alltoegether. It seems Atlassian is unwilling to do this because of their notion of how velocity is used in relation to the backlog, which I disagree with, but it is what it is. Or just make it an option in the board configuration! 2. Or, Attlassian can give us the option to automatically exclude the parent estimate from Remaining when sub-tasks are present. They already have a special UI for this case (the parent/sum representation of Remaining). 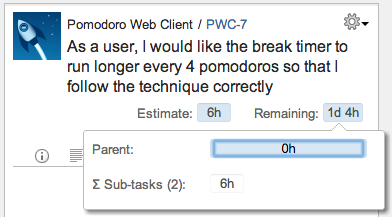 In the board configuration, there could be a checkbox to the affect of "Exclude parent Original Estimate from Remaining when sub-tasks are present". This problem is made worse by what appears to be a related bug. I edited a task during a sprint to change the type from Bug to Story, and it re-calculated the Remaining, putting the parent's Original Estimate back into it, and creating a big spike in my burn down. I manually removed it, so the line is back where it belongs, but the spike is still there. Very hokey. I was expecting to be a big fan of this software, but these hassles are making it a pain. When I set an original estimate for the story and set it back to zero in the remaining estimate for the parent, the original estimate is also set back to zero - so nothing really happens there?!? please fix this problem, let your customers decide how they will handle their estimations..
What you are not considering is that it is possible to plan your stories with storypoints in the long term and only plan the time estimates ind the sprint planings right before a sprint and use a burn-down on those time estimates. that's how we do it - it's not possible to plan the whole project with time estimates - that's why the whole story point thing was invented! but during a sprint you want to track things on time basis. Can you please check if you have Legacy Mode enabled in your JIRA instance as discussed above? That's the only reason this would happen (i.e changing the remaining estimate affecting the original estimate). On your desire to use story points for long term and time for sprint tracking, we definitely support this. Just enable 'Story Points' as the Estimate unit for your board but enable Time Tracking as well in the board configuration. This will allow you to burndown hours in the sprint but keep track of story points over longer periods. you were right, legacy mode was active - I didn't really get that there was a change in this regard. I'll try it again with legacy disabled. when I set the estimate to story points - what exactly does this do? just change the basis for velocity calculation and what's shown on the right hand of my issues in planing mode? it doesn't interfere with my hours burndown charts? can i switch between those estimate modes anytime or would that mess with the calculations? When you switch on Time Tracking you simply tell GreenHopper that during the sprint you'd like to have the burndown be based on hours (attached to issues and sub-tasks). This causes GreenHopper to show the remaining time estimate in the sprint footer on plan mode and in the detail view. It also causes GreenHopper to show the remaining estimate at the bottom right of the card in work mode. You can switch estimate modes whenever you like but the problem is that the calculations are only as good as the data. For example, if you switch to Story Points but most stories in past sprints did not have story point estimates you'll get useless results. I'm not sure what you mean. If time tracking is enabled we do show the sum of the remaining estimate of the sub-tasks and the parent issue on the right in the detail view (and in the sprint footer). This isn't the estimate (i.e. the value used by velocity) because of all of the points discussed above (i.e. you could only plan as far as you'd broken down in to sub-tasks, you'd be mixing high and low accuracy estimates and distorting velocity). Is there any way to check if Legacy Mode is on without first disabling Time Tracking. Even though the docs claim this won't hurt, I would feel safer if I could just check the setting without changin anything. I have a comment/question about your detailed explanation. Let's assume we have a team of 4 and our average velocity is 20 story points per sprint. So the goal during sprint planning is to fill the psrint with 20 story points. Let's assume we have a story with 5 SP in the current sprint. Now imagine that for the current sprint, almost everything is completed except you need one more 1/2 day on that 5 SP story so it get's moved back to the backlog when the sprint is closed. So now, when you plan the next sprint, the 5 SP user story counts towards your planning the way it is now causing you to not put enough stories into the sprint. How does one deal with that? Might be a stupid question, but can we get the burndown report to burn down based on sub-tasks, if I give the sub-tasks story points? I like to have tasks grouped, and have these grouped even further by epics. It is a bit of a mess having to many stories just piled together. Ie. we want to make a new feature on our site, say a mini game "pack man". This takes about a sprint. So we make an epic for that. A task might be "As user I controll pack man with keyboard" which might take a week, and lastly there might be 8 subtasks to this. The burndown will be a week behind when the task i burned down. It is hard to figure out if one of the subtasks are stuck and there are problems. We have been giving sub-tasks storypoinst for several years. Now of a sudden, GH tells me "The following issues does not have estimates" because the stories doesn't have SP's, only the sub-tasks. Extremely annoying, and I do not like to change our process when it works so great for us . We are switching now from the classic to the agile board and we would like to have also this feature. This seems to be something logical for everybody. We don't really care where you show it, but it is for us a very importat parameter and we would like to have it in the list overview and not in the details pane. 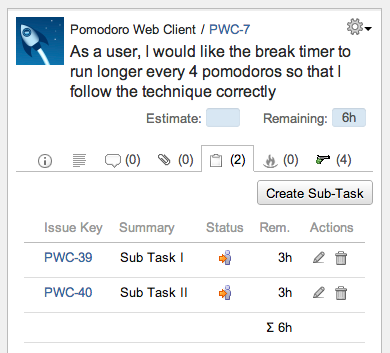 We want to see all the stories with the sum of the estimated hours of the subtasks. From the point of view of the agile it can be so horrible but our customers want to know it in hours, our management want to have it in hours, our project budgets are in hours. We can't convert hours in story points and vice versa, we have to works with hours, that you find it stupid, illogical or whatever, we can't change it. So please just show somewhere in the story the sum of the estimated hours of the subtasks. So is there a way to total hours for a sprint per user during planning? Or anything else that can help me achieve my goal? Related to the epic/story/subtask hierarchy mentioned above. Install Script Runner addon (free). Please stop suggesting expensive plugins as workarounds for Atlassian bugs. Hi, I have some comment to the estimation and how it should be done. In our company (100 000+) we define stories as just holders of tasks and a story estimation and remaining is just sum of its tasks. When we do our planning we split story to tasks and time estimate, during the sprint we finish of tasks and stories. Green Hopper presumes that you are just planned for a story and not task and that during the sprint we will burn storys remaining time and not tasks. In this way then stories are going to just be empty boxes with no estimation and logging, since logging work on a task will not remove time from stories remaining time. This solution also leads to statistics not being so detailed about teams work, like how much time was put on certain subtask type, or what sub task took too much time to handle since those stats are hidden in the story. I suggest you make the option for teams like ours that do estimate each task so that the story will include just the tasks sum of original estimate of its tasks during planning. During work if a task is added then only the remaining time of the story would be increased only and original estimate unchanged. If the sprint finishes with some tasks left unfinished in a story then the story would be put in the backlog and its original estimate would be changed to the sum of the original estimate of its remaining tasks in it. If you operate this way (only ever apply estimates to stories once you have broken them down in to tasks) you will only be able to look ahead in the backlog and predict the amount of time needed to get there up to the last story you have broken down. If you only break down stories during planning you will be unable to look more than a sprint ahead and predict how long it will take to deliver. GreenHopper does not presume that you burn stories remainign time and not tasks. If you enable time tracking the burndown chart will show the burndown of the time estimates against the tasks. For example, if have a story A with tasks A1, A2 and A3 the burndown will show any remaining estimate you burn down on A1, A2 and A3. You can see the information about how long certain sub tasks took in the burndown. We will not change the original estimate for the story, but you are welcome to either ignore it (i.e. leave it 0, causing the velocity chart to show 0 for each sprint) or edit it to equal the sum of the remaining estimates of the tasks. You can do this easily by copying and pasting it on the story level during planning. Hi Shaun thank you for quick answer. Let me clarify a few things. 1. We split the story into sub tasks during planning just before we kick off the sprint. Before that like you say the estimate is on story as you said. But still you should have an option that then during the planning of the sprint be allowed to change the behavior to switch from story holding the estimate to it be just sum of its sub tasks. 3. Leaving story with no estimation leads to velocity = 0 at the end of sprint. We have also tried putting the estimate manually to sum of the children , but when the sprint is finished and you look at amount of work, then you will have double the value since the estimate of a story is added to estimate of all the children. My suggestion is not going to replace your way of doing things, it could be an option just like different kind of estimation you support today. And if you look at the registered bugs and discussion in confluence site you see that many people would like this behavior. Leaving story with no estimation leads to velocity = 0 at the end of sprint. We have also tried putting the estimate manually to sum of the children , but when the sprint is finished and you look at amount of work, then you will have double the value since the estimate of a story is added to estimate of all the children. No, the velocity chart never shows the sum of the children, it only ever shows the value in the parent. So if you set the Original Estimate on the parent to the sum of the children you will not double count in the velocity chart, it's just that the first time you do this the Remaining Estimate for the story will be automatically set to be equal to the Original Estimate by JIRA so you'll need to clear it to avoid having the burndown chart double count. We're having a similar problem, one of our teams break down stories just before sprint planning adding estimates to subtasks and thus remaining time. This estimate is more informed and thus must be more accurate. It can go up or down, sometimes drastically. Previous estimates are useful guidelines but not as accurate, they are the same though, both estimates of the same thing, they can still be used for release/roadmap planning - the velocity of the better estimated stories can still be applied to the whole backlog - in fact it's a better, more accurate velocity, and should have a smaller standard deviation. So firstly a "replace estimate with sum of subtasks" feature on the story would be useful - in plan mode (right mouse click on story > replace estimate, or a "sum to estimate" button on the top of the subtasks list in the detail, or even a "use sum of subtasks). To solve this issue above, if you showed Remaining Estimate (story+subtasks) in backlog alongside estimate you would have the two pieces of information you need - seeing the total time remaining is crucial for sprint planning but then you also need to see the detail to set priority in sprint. Sorry I was not clear there, when looking at statistics of Stories the amount of work put on the story is double. I do not mean the velocity here but general statistics of the finished stories. We have been now thinking of yet another way of doing this to pass this shortcoming, and that is to not to put any estimation on sub task, and use them just to move around in the task board. Also logging the work done in the subtask in the story itself. I think this will solve most of issues BUT it means it will be a bit more difficult to go back and see what has been done in a specific sub task. Then you have to look at a stories work log and search for work logged for the sub task. Also the powerful statistics tool in greenhopper and Jira can not be used as good as before. I'm really not sure what you are saying here and I think there must be some confusion. If the 'double' counting is not happening in the velocity or burndown charts where is it happening? To show you what I mean, I've put together some screenshots below. Please Note: You will see different behaviour if you have legacy mode enabled for time tracking in your JIRA instance. It is not recommended to use legacy mode (and it has not been the default for many years). Now if I go ahead and copy that 6h to the Estimate field it will double the reamining time because JIRA is copying the original estimate to fill the remaining field. (Sorry for the "Remaining Time Estimate" overlapping the heading, I had to resize the page manually to prevent it being too large). The net result is that you can achieve the result you're looking for today with minimal change to the way you work. i understand you explanation, but still we re the opinion that your mentioned "workaround" to go through all stories and delete manually the parent s remaining estimate cannot be the solution in a long run! Please, keep an eye (or better an ear) on your customer and think about how to ease up this situation, thanks! This is an awkward workaround at best. If we've taken the trouble to enter sub-task estimates and want them to bubble up to the story, then it doesn't make sense to renter them on the story and then subtract them out so that they don't register twice. What happens when you enter a new sub-task and forget to enter the hours to the story? What happens when you forget one or two of these mathematical gymnastics steps over dozens of stories and even more sub-tasks and then have to try and figure out why the time is off? There has to be a better more intitive way. This workaround doesn't seem to work anymore. Edit Issue > Progress > Set to 0 > 'Estimated' in the 'Time Tracking' will still be a sum total of Story Estimate + All Sub Tasks. We use Jira and GreenHopper view to browse and manage issues and sub-tasks. Jira accamulates sub-task original estimates but GreenHopper accamulates only remaining estimates. We cannot go ahead with this. IT STOPS US BUYING IT! Can it be implemented as a setting which would allow to accamulate sub-task original estimates to parent original estimate in GreenHopper view to make it be consistent with Jira view?! Please, just allow people do it if they need it. Add me to the list of people who see a great value in having the option(!) to add up estimates from a task and its sub-tasks in GreenHopper as well, for the reasons mentioned several times in this thread. Btw. : I only signed up so that I could write in this thread. I hope this stresses once more that this topic is important for us. I have a problem with the current planning board. We usually estimate stories using story points, but during sprint planning, after we break stories down to tasks, we estimate them using ideal hours. This is exactly what Scrum suggests. However, after the team choses the stories for the current sprint during planning, and after filling out the ideal hours estimates of the tasks, one should be able to know whether the sprint work is within capacity. So there should be a way to see the total ideal hours per task type. One example where this is necessary (not just optional) is if a team member was on vacation for the sprint being planned. The capacity would decrease. The only way to deal with this is if we can see the total tasks estimates per task type. The task type is important because we have developers, designers, analysts and QAs in the team. So the total alone would be useless. Determining whether the sprint work is within capacity is part of Scrum best practices so I think this should be included in the planning view of the Scrum Board. I much agree with this, however I would say that being able to see total hours for a sprint by task type is secondary to seeing total hours per user. This gives you the ability to do group allocation planning as well as developer allocation planning. I was always under the impression they want you to pay for another 3rd party plugin to achieve that in an overview-way. We re using a filter which collects all efforts of the new (to be started) sprint, put it in the workload pie chart and work on two screens. Can't you use the pie chart gadget, and create a filter for that sprint. Oh no if it is a sprint in planning you can't, there is no field for planning sprints. But if you put a version or labels on all issues in the sprint then you can. In my experience what scrummasters do a lot in Scrum/Agile is to count numbers. Sum up numbers from different estimate, recalculate numbers, because a scope change. And so on. 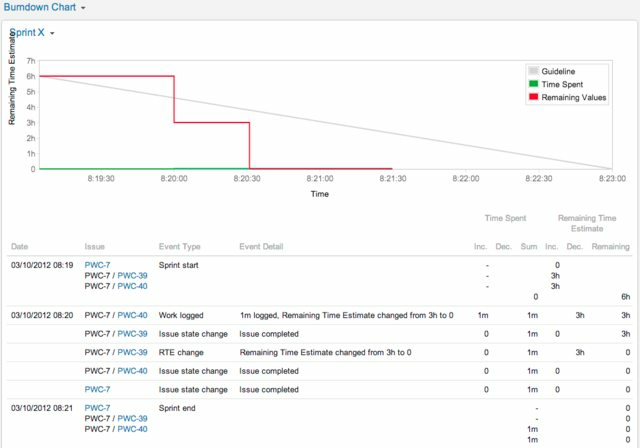 Why is Jira - Agile so bad at it (when you look away from reports and dashboards)? The numbers are there, it has to be the simplest thing to do? It would be awesome just to select some issues and it would show a sum of the issues in a floating box or something like that. Ok, that's true. Now planning sprints have a number. Wow have not noticed that, cool. That makes stuff easier for us. I did a little something its not perfect at all should any of you do better just put it here. Hi, I have a question for which i am hoping to get clarification asap as my sprint has already started. In the 'plan' mode, I see 0 as the estimate in gray bubble (in table having list of issues in scope for sprint). In the issue view on the right side of the screen, I see estimate as 0d. However, when I open this issue in a separate tab, I see that the issue has an estimate. Q1. How come the issue actually has an estimate, but is not visible in the sprint table or on the right side? Q2. Is it necessary that every issue in the sprint table have an estimate in the gray bubble? Reason I am asking is because if I enter an estimate in plan mode, then this estimate will get added to the actual estimate that exists (and is visible) in the issue detail view. Isn't that like double-counting?